A DNA analysis of wheat found in an ancient peat bog suggests early Britons were more commercially sophisticated than previously thought. The presence of wheat on the British Isles a full 2,000 years before farmers began cultivating cereal grains means these hunter-gatherers may have established important trade connections in Europe. Archaeologist believe that farming didn't reach the British Isles until about 6,000 years ago. But the discovery of wheat submerged under 36 feet (11 meters) of water just off the Isle of Wight indicates that it may have arrived in Britain by some other means 2,000 years prior. The site was clearly occupied by hunter-gatherers, who may have built wooden boats. [The] team took four core samples of sediments from a section of the site littered with burnt hazelnut shells apparently left by the hunter-gatherers and subjected the samples to both radiocarbon dating and ancient DNA analysis. 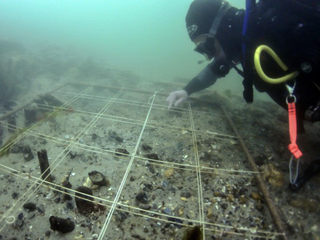 The samples' wood and plants were dated to between 8020 and 7980 years ago, after which the site was inundated by the rising seas that created the English Channel and separated Britain from France. That's a surprise, one that's resetting our notions of when Western Europeans and Britons transitioned from the Mesolithic to the Neolithic era, i.e. when hunter-gatherers made the jump to farming. The researchers don't believe the wheat was cultivated by the hunter-gatherers themselves as no wheat pollen was found in the samples. Rather, they suspect that farming spread to western France earlier than assumed — about 7,600 years ago. Alternately, nomadic hunter-gatherers of southern Britain may have ventured deeper into Europe than we realized. To do so, they would have established trade connections and the requisite boating technologies to travel across the Channel. Or maybe Europeans came to them. "Archaeology constantly throws up surprises, but these findings look puzzling to me," says Peter Rowley-Conwy, an archaeologist at Durham University, UK. He points out that farming had hardly spread north of the Danube 8,000 years ago. "This seems too far for hunter-gatherer networks to extend," he says. "Artefacts such as flint blades and arrowheads that appeared around that time from Portugal to the Urals never made it to Britain — it's hard to believe that wheat should." The findings need to be confirmed in the greater context of existing archaeological research, he says. But Mesolithic settlements that could shed light on the issue are hard to find in mainland Britain. To understand how and when Neolithic culture arrived, says Allaby, "the answer probably lies under the sea". Indeed, more evidence needs to be collected to make a more certain proclamation. It's conceivable, for example, that it was just a one-off thing, or something limited to a very small population. Nonetheless, it's a fascinating discovery that's giving British archeologists lots to think about. Read more at ScienceNow and Nature News. The scientific study can be found here.